Recently, I had the great privilege of capturing one of those very special moments in life – the joy of soon-to-be-motherhood. Amanda was excited, super excited, for her maternity session. I wanted to make sure that she had something different from the everyday maternity photos that you see floating around social media, so we sat down and figured out what she thought about her pregnancy and what it meant to her. As part of a great cycle (more so than ever, now), we settled on a gorgeous little area of central London wherein lives the Tree of Life. No joke, it’s actually called that and it was perfect for what we had in mind. It’s a big, beautiful tree, quite majestic in it’s enormity. The name suits it, though, as it stands near to the middle of a fair size green space right in the heart of London. Initially a little timid in front of the camera, Amanda settled more and more into a comfortable rhythm as we moved through the environment. I wanted to set a pace that was in no way rushed, a gentle and thoughtful journey of sorts that allowed her to reflect on her own life-changing journey. It was a way for her to re-evaluate some of the emotions she had been feeling and the events she’d experienced leading up to the session. For me, it was an opportunity to really blend her situation and experiences into the environment we were in. The “all natural” look was what we were aiming for – the new mother surrounded by the original Mother – and one I believe we pulled off quite nicely. Too often, things get bogged down in complicated details. Simple is sometimes best. 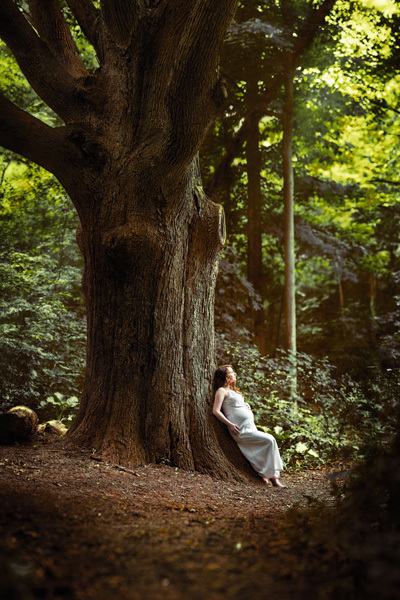 Looking for your own maternity photos? Simply email me or call 519.619.3237 to book your own personalised maternity session. This entry was posted in Families and Kids and tagged Baby Bump, Due Date, Family Portraits, First Time Mother, London Ontario, Maternity Photography, New Mothers, Photographer, Portrait, Pregnancy, Pregnant, outdoors, photos.